‘…God used music to allow me to express my emotions, my pain, my anger, and guilt. Through all this He has given me a passion for all the kids out there that might be going through some of the things I did. That’s why I rap and write the way I do, that’s why my music is raw and real. I believe music should have real meaning, for real life problems. God has used some of the worst things in my life for good…’ Nate Feuerstein, who performs under his initials NF, is the latest artist to be signed to Capitol Christian Music Group; home to many prominent artists like Sanctus Real, Mandisa, Matthew West, Michael W. Smith and Britt Nicole. And while NF may seem like an odd choice to be signed to the label, especially with the plethora of CCM artists that are attributed to one of Christian music’s most popular and most accessible musical labels/brands; what NF gives to Capitol CMG is a uniqueness that may not be found in any other CCM label. Releasing his debut project on August 5th, Nate’s hardships in life, emotion, pain, hurt, anger and guilt is poured out in each of these 6 songs. Already with the success of his first single and first song “All I Have”, many have touted him as the next Eminem. This Gladwin Michigan raised 23 year old (yes, even younger than me!) is able to sing about vulnerability and real issues, making this new EP to be one of the most enjoyable EP’s I’ve heard in recent history, even though I may not necessarily be inclined to listen to rap/hip hop if I were to pick a genre to listen to (I’d usually prefer pop/rock/CCM/worship). The first radio single from the EP, “All I Have” gives us an autobiographical account of NF’s life to date. With unique electronic effects and a great beat, NF raps like his life depended on it- and from hearing his story through rap and rhyme, we see that NF’s tale from hardship to grace is a remarkable one. From being abused to struggling with anger issues and dealing with his mother’s drug overdose, “All I Have” is a plea, from the artist to the listeners, from the artist to the label, and from the artist to the people that doubt him, to give him a chance in a music industry that drops artists from labels as quickly as they sign them. The poignant lyrical message of the chorus that shows NF pleading to ‘…don’t tell me this isn’t for real, don’t tell me this ain’t how I feel, this is all I have…’ is a reminder- to pursue after the things we are passionate about, and to never quit, knowing that what we pursue has been put on our hearts by God our Father, Provider and Friend. A sobering account to treat newer artists with respect as we see that ‘…I thought all you had to do is get a record deal, and yo, things start movin’, but that’s not the cause because most of the time, the artists you hear, you keep on thinking that artist is new, but that artist has probably been at it for years…’; “All I Have” is one of my favourite rap songs I’ve heard since Lecrae and Andy Mineo’s collaboration on the 2008 hit “Background”. Well done NF for an impressive start to an EP that’s going to be celebrated and talked about in all forms of Christian music! “Wake Up” is a musical dichotomy as we are met with the slow serene piano prominent chorus that calmly creates a moment where we realise that ‘…you spend your life in a dream that you can’t escape, cause you live your life in a coma, you’re never awake…’, while contrasting that to the fast-paced hip-hop verses where NF gives us confrontation, contemplation and comfort in us knowing that all we need to do to turn from the busyness to the calm is just to wake up as we delve deeper in God’s presence. A song that is crafted in a way that places NF as one of the most ingenious rappers/music choreographers since artists like Lecrae and Andy Mineo; “Wake Up” is for the person who may feel worthless, and in need of an encouragement to just wake up and turn to the Father. “Hands Up” is an ultra-high intensive, passionate, powerful and empowering track, calling us into a place of surrender- hands up to Jesus as we give our problems to him. As we see in just about every song, NF uses his personal experience to flood the verses as he expounds on the theme prevalent in each melody. “Hands Up” is no different, giving us hope as we hear NF’s testimony, that ‘…if this was all for money, I’d quit years ago, but it’s not, so turn me up until my ears explode…’, while also reminding us that placing up our hands is rather a sign of strength and reliance on our perfect Father than weakness and frailty that people often suggest. “Only One”, “Thing Called Love” and “Just Being Me” bring the EP to a close and offer something unique and different than the first three tracks. “Only One” brings NF into the singing frame (instead of just rapping) as looping percussion and a heart full of emotion brings with it a CCM/dance-esque melody (still with a rap undertone) but nevertheless a song that could easily fit between two songs on a station like Air 1 or K-Love. With the song having an ambiguity and can be interpreted as either singing to God or to a loved one (which will hopefully draw more listeners to not only this song but to the rest of the NF EP), “Only One” leads into “Thing Called Love”, a song that speaks about the topic of love- a love of family, friends, what we have to things that build us up or even tear us down, and even the love we have for our maker, creator and Friend. With all the facets of love discussed in this 5 minute track, we see from NF’s point of view that ‘…this thing called love, can be so cold, it can be miserable, or it can be beautiful…sometimes it’s amazing, and sometimes it’s crazy…’ and how love, if experienced in wrong situations, or in a wrong frame of mind, can lead us into circumstances that may be destructive or hurtful, and counteractive to what God longs for love, especially His, to be in our lives. Ending the EP with “Just Being Me”, an electronic remix string prominent song that shows NF defending his songwriting in the statement that ‘…I’m just being me…’, while questioning the status quo- ‘…whatever happened to music that meant something? Cause nowadays I look around and music don’t mean nothing…’, it is in this melody that we realise that God gives us stories and opportunities to share our moments and testimonies with others- NF is just doing it on a larger scale. NF has surprised everyone- from listeners to his music, to record labels, and everyone else in between. NF EP is a revelation- his energy infectious, rhymes catchy, lyrics encouraging and passion motivational. Full of honesty, musical ingeniousness, articulate rhyme and enjoyableness written all over the album, NF joins the likes of Da’TRUTH and Flame during release week to launch his EP in Houston Texas. His rap style and music will continue to be the talk of the town in months and years to come- expect his name to be floating around both the Christian and mainstream industries a while yet. 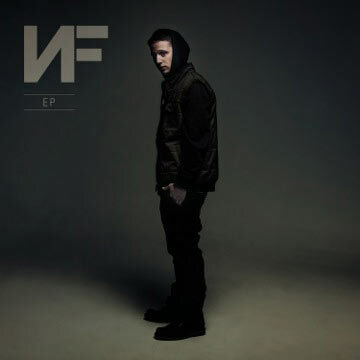 Fans of Lecrae, Flame, Da’TRUTH and Andy Mineo are sure to enjoy NF and his batch of 6 songs. Well done NF for such an enjoyable and heartfelt EP. Can’t wait for more music in the future!